Microsoft Tag’s Blog has mentioned our forthcoming horror film, 5:13. 5:13 a thriller movie slated to release in 2010 just implemented Microsoft Tag in their movie poster. Highlighted in yellow bellow, the Microsoft Tag can be snapped allowing the public at large to gain access to mobile content, including mobile trailers and downloads. Using Microsoft Tag on printed materials creates the opportunity for indie and corporate movie companies to increase the ROI on their print marketing efforts. With Microsoft Tag print advertising can now serve as a real life portal to the online world. Keep an eye out for Microsoft Tag on other print material in your area and for the release of 5:13. 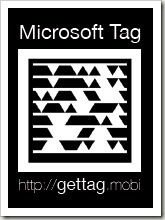 You can read about our experience with using Microsoft Tag here. We believe it’s going to be a fantastic way to deliver our mobile content to nearly all internet capable mobile phones. And, whilst we have your attention, feel free to “give the tag a go” – just download the app from http://gettag.mobi and point your phone at our tag (above)!